We don't guarantee that every single stock pick or signal that we provide will be a perfect money-maker. No one can do that and if they claim they can, well, our advice is that you be very, very cautious. What we do guarantee is that our site will bring you a wide variety of stocks and ETFs that are making moves right now. We scan through over 6000 stocks and ETFs and we consistently offer a selection of interesting stocks picks that you might never have found elsewhere. The bottom line is that we have something for every type of investor: trend followers, swing traders, value investors, dividend investors, those who like small caps, mid caps, large caps, ETFs and more. Look to TradingStockAlerts.com for a unique and provocative selection of stock picks with unparalleled variety. Every week we scan and test almost all of the stocks on the major exchanges. We evaluate trending, technical factors, cash flow, various fundamentals and more. Our custom stock screening tests to see which stocks are making moves right now. Alert HQ is perfect for adding to your stock market watch list. If you are a self-directed investor looking for fresh stock market data, our site can be an extra stock screener and a source of new ideas for your own stock trading system or trading strategy. Reasonable Value Stocks Raising or Cutting Dividends Profitable Growth Stocks Total Return Ratio Top Momentum Stocks Combinations of the all the above! 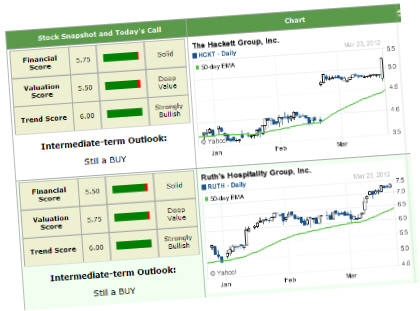 Alert HQ "Stocks to Watch" is the only site where this kind of value analysis and technical analysis are brought together in these unique ways to highlight those stocks that are making moves but are still under-valued. Find ETFs you may never have heard of, identify the top performers in the strongest sectors or look for bargains in the weakest sectors. We calculate a snapshot of each stock where we combine multiple factors to generate a Financial Score, a Value Score and a Trend Score. Then we add these scores up to get one total score for each company and the ten stocks with the highest total score make the list. Top 10 Stocks The best of the best: great financials, strong charts and still good values. Top 10 Buying Opportunities Great financials, good values but charts that have weakened. Top 10 Dividend Stocks Great financials, strong charts, still offering good values while paying a dividend. Top 10 Microcaps The best of the little guys: microcaps ($50M to $300M market cap) with great financials, strong charts and still sporting good value. Top 10 Breakouts These 10 stocks used to be flat but they just broke out to the upside! The E-Zone System provides a framework for looking ahead so you can plan your next trade. It develops your personal stock timing and trading signals for the next day and the next week using the latest in genetic programming. For more information on how we generate alerts and commentary on past alert lists, check the blog posts in the Alert HQ category.